It’s income report day! 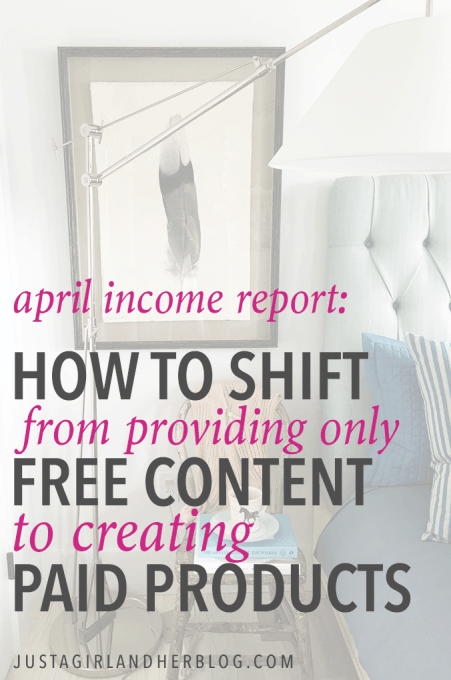 We’ve been sharing income reports on Just a Girl and Her Blog for a few years now in hopes that by being transparent about what has or has not worked for us, we can help others who are trying to grow their online businesses as well. You may notice that the format of this month’s report is a little different, and that is on purpose. We want to make sure that we are doing a good job of relaying what we learned and the strategies that have been most helpful for us, rather than just pointing to a bottom line. The last thing we ever want to do is deceive people into thinking that blogging is some sort of “get rich quick” thing or that if you just do XYZ you’ll have instant success. We spent many, many months making $0, putting money into the blog without making anything before we made our first cent. We are only able to blog full time today because we first spent years learning, improving, researching, growing, and working harder than we had ever worked before. It’s definitely a process, one that continues to be ongoing. That being said, we love talking about blogging and online business strategies, and we know that some of you do too! So we hope that these reports can be a positive contribution to that discussion and that we can help each other learn and grow in this world of online business. Our biggest takeaway from April: Don’t skip steps! Most of April was consumed with our BookBoss course launch. We’ll examine the whole launch process in detail on our other blog, BuildingAFramework.com, but I wanted to take the time to talk about all of the things that had to happen to get us to the point of launching our first full-on course. When we look back at how our blog and business has grown through product creation over the years, there is an obvious logical progression, a step-by-step process that we went through to get where we are today. It would’ve been detrimental to our business if we would’ve skipped some of these steps. We didn’t just jump in our first week of blogging and start cranking out products. We focused first on growing our audience, providing them with tons of value for free, and building a trusting relationship with them. We also took the time to learn the skills and gain the experience necessary to develop increasingly successful launches; it didn’t happen overnight. We had to take it step by step. Phase 1: Content upgrade on our most popular posts. This is the first step we took to create some extra bonus content for our audience. 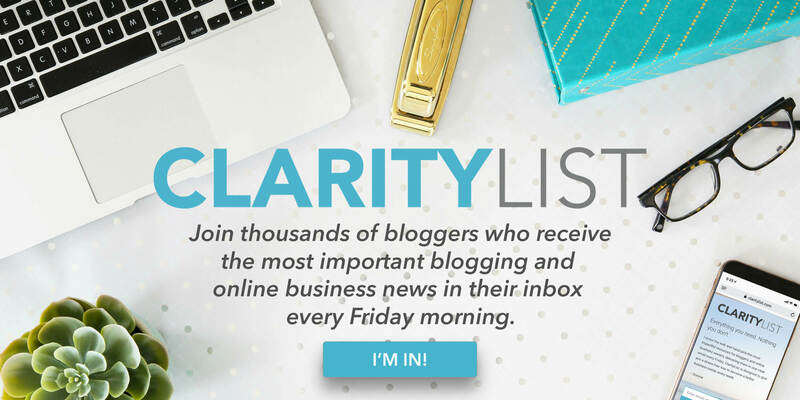 One of the best things we’ve done for our blog is grow our email list, and in order to do that most effectively, we’ve given something to readers for free in exchange for their email address. Going through this process taught us how to create a compelling offer and use words our audience understands and resonates with. If you feel like your first attempt at a content upgrade doesn’t catch on with your audience like you hoped it would, that’s ok! Try to evaluate why it didn’t take off, make some changes, and try again. Phase 2: Free email course. A free email course is more work than making a content upgrade, but it can serve a lot of different purposes. Offering free email courses has allowed us to take some of the existing ideas on our blog and go deeper. It has also helped our readers to get to know us better though our unique voice, and they can also get a sense for our teaching style better than in a single blog post. Offering free email courses has also helped us to build trust with our readers– we are providing tons of value for absolutely free! Free email courses can set the stage for paid products in the future as well. Phase 3: Write and launch an eBook. This was the subject of our new course, BookBoss. The experience we gained from creating content upgrades and free email courses definitely served us well when it came time to write an eBook. Launching an eBook is a multi-faceted process– you have to think about building a launch list, writing your book, formatting your book, developing a launch plan, working with affiliates, creating a sales page, and continued marketing long after your launch– but when all of these steps are done effectively, you can create a profitable passive income stream that boosts your bottom line month after month. Phase 4: Course Launch. 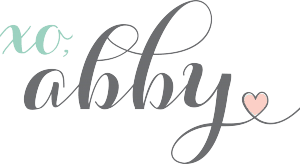 A lot of people have asked Abby and I if they should write an eBook or launch a course with video content. If they haven’t launched an eBook yet, we recommend they start there. Most people severely underestimate how much time and energy it takes to do the marketing and promotion side of the launch process– it is a TON of work! The great thing about eBooks is that the content is much easier to create, so we had more time to focus on creating and implementing a solid launch and marketing plan. That launch experience is invaluable; once we were more familiar with the launch process, we were more comfortable adding video elements and creating courses. Trust is another reason why you should launch an eBook before creating a course. In order to help people make the transition from coming to your site for free content to becoming a paying customer, you’re going to need to earn their trust and prove that the information you are providing is valuable. It starts with a simple content upgrade. Then you earn a little more trust from your audience when you give them a free email course, and finally when the time comes for an eBook launch, they’re excited to make a purchase from you. On the other hand, the leap of trust from a free email course to a pricey $200 course is large. Inexpensive products like eBooks help to bridge that gap and build readers’ trust and confidence. The great thing about following this plan is that we were able to hone our message and delivery over time. In all four phases what you’re producing could be related to the same topic, but in each phase you go deeper and deeper with the subject. The content can be updated, expanded, improved. The time will come to launch a course, but make sure you’ve had the necessary learning moments first! Wherever you are right now with your blog and business, work toward moving to the next phase. Focus on how you can help your audience and meet their needs, and they will be thanking you for the valuable information you provide! 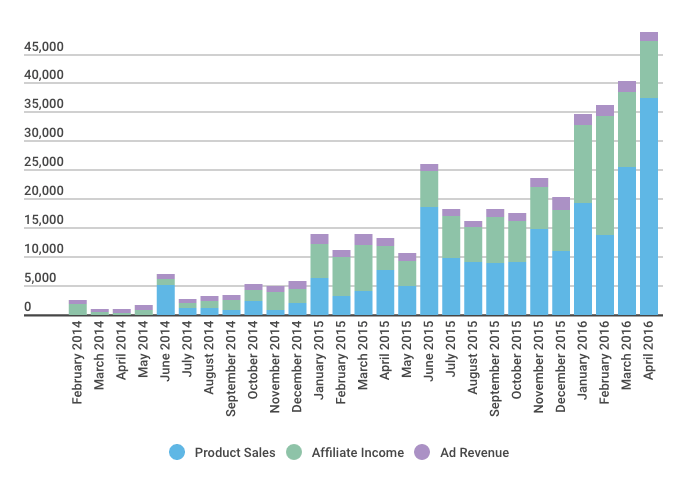 We’ve been publishing monthly income reports since February of 2014. You can click here to see a running tally of past income reports. As you read this report, it’s important to remember that this income didn’t happen overnight. It’s been a long process and a lot of work! Our blog income our first year was very minimal, and we didn’t publish the first income report until we had been blogging for a little over a year. We strive to make these reports as accurate as possible, but our business accounting typically does not match these numbers exactly. These reports count income which was “earned” during the month but not necessarily paid out to us within that month. With many affiliate programs there is sometimes a significant delay between earning a commission and actual payment to us. We hope you find the reports helpful! I’m a visual learner, so I love charts and graphs! This graphic is helpful for seeing how our blog income has progressed over time and which income streams have contributed most to our bottom line. SNAP Conference 2016 — It’s All About Community! Think about where you are in your blog and business. If you don’t have one yet but find yourself reading these reports every month, it’s time to start! If you have a blog, do an honest assessment based on the information we shared at the beginning of this post and determine which of the four phases your blog is currently in. Don’t spend time reading and learning about something multiple steps ahead of where you are currently — work on the very next step. You’ll be amazed the progress you can make! I love blogging. I love being able to share ideas, interact with people all over the world, challenge and stretch myself in so many ways, learn new things, and use my creativity. I also love that it is a process more than a destination– there are always things to learn and ways to grow and get better. Enjoy the journey. Learn from others around you. Never stop growing. I’m excited to see where you go from here! It is always so great to read your income reports. I love that you stress how much time it takes because with some blogs, they seem to erupt into money makers over night! I have only been blogging seriously for about 2 months and occasionally get a little down with the fact that I haven’t made any money yet. But this post was so helpful. I need to start creating some free content on top of my blog posts and start going through the phases you listed. Thank you so much! Aw, thank you for your kind words Sahvana! So glad that the income reports and Building a Framework eBook have been so helpful to you… LOVE to hear that! Have a wonderful week and happy blogging! First off, good job this month! Looks like you are continuously growing, improving, and succeeding, which is awesome! I have been doing A TON of research recently in preparation for starting my own blog. (yay!!!!!!) I’ve spent a massive amount of time doing research through various sources and continuously run across your blog and your posts. So I decided I needed to tell you thank you! I’ve read quite a bit of your material, which is always helpful and fun to read. You have virtually been helping me a lot during this process and I appreciate it very much. So thank you! Aw, thank you Klayci! You are too sweet! I’m so glad our blog as been helpful to you… LOVE to hear that! Have a great week and happy blogging! I’m so grateful for your guys! You are so transparent and so incredibly helpful. Thank you for sharing your knowledge about building an income. I have blogged in the past, but just recently launched my new blog with hopes of providing an ebook in the future. I love your steps to success. I agree that it is so important to grow an audience and give things away first. You have to give people more in value than what they are paying for every single time. Thank you! You are too sweet! Thank you, Kayla! So glad it was helpful for you! Thanks so much for this progressive breakdown. As one of your students it is invaluable as a reminder that it takes time and I’m doing it right by going slow and steady. Thanks Abby and Donnie! What an incredible month and thank you for the reminder that it does not happen overnight! I am most definitely in Phase 1, but it’s extremely helpful to see where to go from that Phase as you guys so clearly laid out. Thank you! Very interesting to see your monthly report, But I cannot see your Google adsense report while you show it in this blog. Thanks Arlan! We don’t use Google Adsense anymore but now have our ads managed by Ad Thrive. That’s incredible! Thanks for sharing your success! I’m curious why you don’t include pageviews in your report. We usually do! 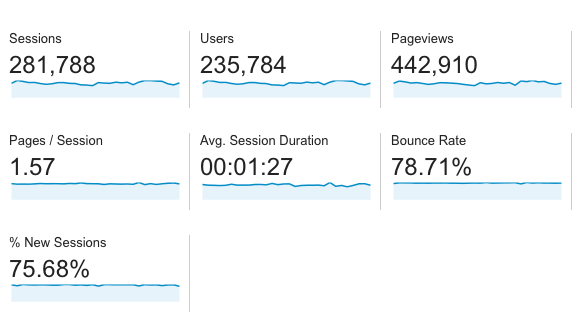 We changed up the format a bit this month but all previous reports have traffic numbers. I just started including income reports on my site ( https://www.incomesage.com ). Right now it’s pretty basic but I’m happy with my results and the report is definitely a work in progress. Wow, this is not only an income report this is one plus an additional blog post in one. Thank you so much you two! The information is as always very valuable and I can’t wait to implement it step by step. I’m currently re-reading your amazing “Building A Framework” e-book now that my blog has launched, so that I can implement all your strategies following said launch and keep learning and improving! Congrats again on launching your blog, Sandra! I know you have put so much hard work into it already, and it definitely shows! Hope you’re having a wonderful weekend! Thanx for sharing your income report. It will inspire people to come into blogging.